"The Cavalier Years" / "Blackadder's Christmas Carol"
Produced in 1988 for the first ever Red Nose Day, “The Cavalier Years” is a 15 minute short set during the English Civil War that introduces another generation of Blackadders and Baldricks. Red Nose Day, so named for the red clown noses given out to donors, is a biennial telethon that raises money for the UK charity Comic Relief, which was co-founded by Blackadder writer Richard Curtis. 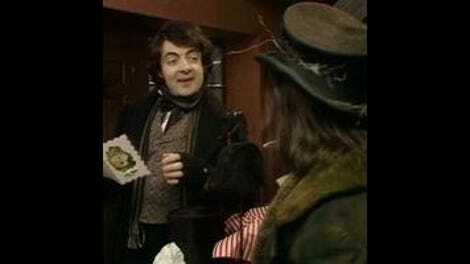 This special is economical, telling a surprisingly complete story in its truncated runtime, and features returning Blackadder actors Rowan Atkinson and Tony Robinson as Sir Edmund Blackadder and Baldrick, of course, as well as Stephen Fry as King Charles I and Warren Clarke, who previously appeared in Blackadder The Third’s “Amy And Amiability,” as Oliver Cromwell. Continuing the series’ trend, this latest Blackadder fits neatly between Blackadder II’s Lord Blackadder and Blackadder The Third’s Mr. Blackadder, both chronologically and in personality. He’s more threatening than Lord Blackadder, but for the majority of the short, demonstrates genuine loyalty to the doomed King. He does eventually betray King Charles for a couple very large purses, but at least feels bad about doing so, more than can be said for the good butler. Baldrick is once again Baldrick and feels very much in keeping with his counterpart from Blackadder The Third. As for the King, Fry is said to have based his character not on the historical figure, but on the current Prince Charles and Fry is delightful throughout. The same is true of Atkinson and Robinson, who are as strong as ever in their roles. There are a handful of fun lines, but while entertaining and well suited to its purpose as a Red Nose Day short, this installment is among the least comedically dense in the series. Sir Edmund’s threatening of Baldrick at knife-point, who for once remembers what he’s been told and does not immediately give away the King’s hiding space, is well delivered, as is Baldrick’s purple cup slip-up. Also successful is Charles’ droning on about inner city education programs mid-sentencing, which works well each time it comes up, but the single best gag is a visual one, when Sir Edmund foolishly declares, “may my conjugal dipstick turn into a tennis racket” and immediately upon dropping an orange in front of himself, has it returned, accompanied by the distinct springing sound of a racket. Not all series lend themselves to a format like this, but on the whole, “The Cavalier Years” is a success, telling a complete and entertaining story and adding to the rich history of the families Blackadder and Baldrick. Historical Hairsplitting: Fry’s performance may be inspired by a different Charles, but certain elements of it match parts of King Charles I’s personality as well. He is said to have been polite and slow to anger, and in general a nice, if reserved, person. Also, while Fry’s King Charles I expresses interest in the spelling of inner city youths, as a former chancellor of Oxford, education was valued by Cromwell and he made supporting grammar schools a priority. Cunning Plans: Baldrick’s pumpkin-based scheme is one of his most foolish, though it does trump his previous decapitation-related plan from “Nob And Nobility.” Blackadder’s now consistent use of and reliance upon Baldrick’s admittedly terrible ploys is becoming a liability for the man, who can no longer seem to come up with a plan of his own. Atkinson’s entertaining delivery of “Seize the royalist scum!” is one of his most heightened moments yet, and with that blonde bob, Sir Edmund looks the closest any Blackadder has to The Black Adder’s Prince Edmund. At last, an answer to Baldrick’s parentage: a pig-farmer and a bearded lady, a nice touch considering season one’s Baldrick was very excited about the prospect of being a bearded lady. The redressing of the season three kitchen set into a new space isn’t particularly convincing, and Sir Edmund is far too interested in the minutiae of Baldrick’s life for someone of his standing, but otherwise, on the whole the short looks good. “The Cavalier Years” is not available to stream at Amazon Prime, Hulu Plus, or Netflix, but it is up on YouTube, on the official Comic Relief channel. Set between Blackadder seasons three and four, “Blackadder’s Christmas Carol” succeeds not only as another standalone installment for the series, but as a truly great Christmas special. The trappings associated with this staple of British television are here—the holiday setting, fan favorite cast members, an extended runtime—but rather than struggle to incorporate these elements into a traditional episode of the series, writers Richard Curtis and Ben Elton go a different way, adapting Dickens’ popular A Christmas Carol and giving it their own twist; what sets this version apart is its reversal of Ebenezer Blackadder from the miserly Scrooge to the nicest man in England. This special hinges entirely on Rowan Atkinson, who is fantastic as the kindly Ebenezer. His voice is sweet and gentle, yet not saccharine. He wears a puzzled smile, but a smile nonetheless, as he corrects Baldrick’s spelling, and while Ebenezer is constantly taken advantage of, he is never a dupe. He’s aware of his neighbors’ manipulation of him, but has taught himself not to care, letting go of any frustration and focusing instead on the positive. Just as important as the character’s inexhaustible cheer is his resignation, which lays the groundwork for his decision in the final act. Tony Robinson is once again excellent as a more street-smart, but still far from intellectual Baldrick. This incarnation is the series’ most relatable, serving as an audience surrogate and counterbalancing Ebenezer’s potentially frustrating doormat tendencies. The most remarkable element of the special’s early scenes are its similarities to more standard Blackadder and Baldrick exchanges, and the actors’ ability to completely re-contextualize very familiar dialogue with a shift in tone is impressive. The obligatory holiday special parade of guest stars begins right away in “Blackadder’s Christmas Carol,” with Miriam Margoyles and Jim Broadbent, who were so wonderful together in “The Queen Of Spain’s Beard,” returning to the series to play Queen Victoria and Prince Albert. Broadbent’s Albert is adorable, besotted with Victoria and doing his best to make her Christmas as magical as possible. His stammering attempts to keep his gifts secret somehow get sweeter each time, when they should be getting old, and Margoyles is once again an excellent partner for him. Before the duo arrives, Doctor Who fans are treated to a guest turn by Nicola Bryant, best known as Fifth and Sixth Doctor companion Peri Brown and who here plays Ebenezer’s piercing goddaughter, Millicent. Bryant is excellent in the grating role, bringing humor to a potentially annoying character. Another pleasant surprise is the return of David Nunn, who was a blast as the Messenger in The Black Adder and here plays one of the nut-crazy orphans. Just as important as Ebenezer to the special, however, are the three visions granted him by the Spirit of Christmas, played by returning favorite Robbie Coltrane. The famous structure of A Christmas Carol allows for one more adventure with Queenie and the cast of Blackadder II and another with Prince George and the characters of Blackadder The Third, and fans of the series will undoubtedly be happy to return to these settings and characters. All of the actors slip seamlessly back into their roles and the sequences feel pleasantly familiar, but with enough fresh barbs to elevate them above simple fan service. Rather than return to The Black Adder, the third vision instead features a flash forward to a distant future where—depending on how bad Ebenezer is willing to be—the latest Blackadder is either King of the Universe or a loincloth-clad slave, is delightfully kooky and out of left field, particularly after the more predictable season two and three reprises. The final act of the special, with Ebenezer doling out just rewards to those who wronged him earlier, is incredibly satisfying and just as before, Atkinson and Robinson are great in it. Between the unexpected joy of Atkinson’s performance as the truly kind and goodly Ebenezer, the writers’ clever adaptation of a literary classic, and the canny use of so many of the series’ talented guest stars, “Blackadder’s Christmas Carol” is more than a mere holiday trifle, it’s a showcase for this tremendous cast and one of the series’ best installments. Historical Hairsplitting: Queen Victoria and Prince Albert, as shown in this episode, were very affectionate. Rather than marry strategically, Queen Victoria followed her heart and proposed to the handsome Albert a mere five days after meeting him. Despite initially intending to keep him uninvolved in the running of the country, Victoria grew increasingly reliant on Albert over the course of her reign. Due to his German heritage, the British public did not immediately warm to Albert, though he grew in popularity after his death. 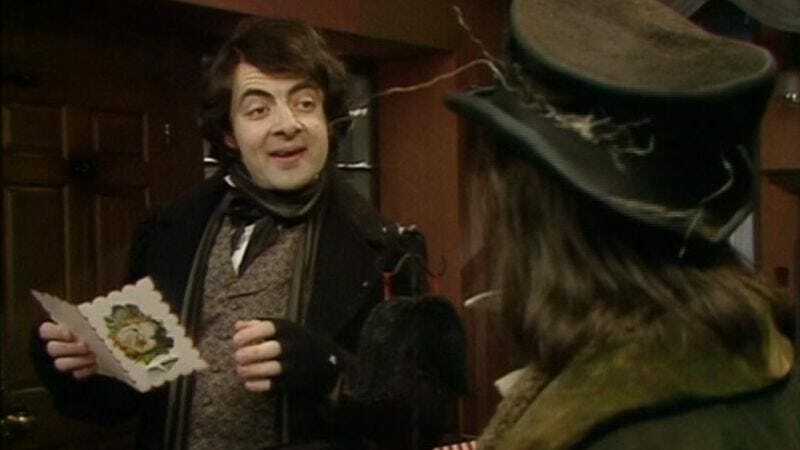 Cunning Plans: Baldrick’s only cunning plans in this episode are to hide his and Ebenezer’s turkey when Beadle and his three enormous orphans arrive and later, to hang his wretched sock up so Santa might fill it. The first is shrewd, though Queen Victoria and Prince Albert wind up with the turkey anyways, and the second has no effect. As for Blackadder, neither of his subtle plans work out as intended, though he manages to improvise his way to the desired results nonetheless, gaining wealth as both Lord and Mr. Blackadder by causing Lord Melchett’s execution and robbing an elderly woman collecting for charity. Ebenezer’s attempt to find wealth through self-involvement is less successful, but then again, compared to his ancestors, he’s still a rookie. Despite Ebenezer owning a mustache shop, none of the main characters actually sport one, though a few do have beards. Robbie Coltrane’s entrance is hilarious, as is his exit, and it’s fun to think about them as a prelude to his eventual casting as Hagrid in Harry Potter and the Sorcerer’s Stone, who is introduced in a similar manner. Using a children’s choir for the opening and closing theme is particularly evocative and the lyrics make it a personal favorite. The final shot at the end of the credits wishes fans “A Merry Messy Kwelfnuve Kweznuz.” It’s nice to get an answer about how one spells Christmas (twice) without any of the correct letters.